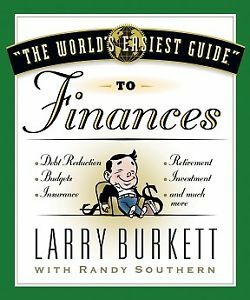 The World’s Easiest Guide to Finances by Burkett, Larry. (During its initial publication, this book included a CD-ROM with an interactive budgeting guide and debt eliminator guide. Many financial resources are confusing to the average person. ). Many financial resources are confusing to the average person. Leading Christian financial expert Larry Burkett answers the call for a simplified, yet comprehensive guide to financial management with The World’s Easiest Guide to Finances . It is a comprehensive reference work that makes complicated terms and concepts easy to grasp with a touch of humor, and builds the confidence of a person of any experience level that they can understand and implement the information. Features helpful CD-ROM with the following contents: Interactive Budgeting Guide: Users simply enter their current expenses and this handy guide provides a visual representation of their budgets. The Debt Eliminator: Users enter debts amounts, payment information, and interest rates, and this helpful tool gives prioritized plans to pay off their debts.